"It was an amazing time in my life," relates Arthur. "One day I would be writing a song with my friends - who happened to grow up to be Carole King, Cynthia Weil, Barry Mann, Howard Greenfield, Alan Lorber, Gloria Shayne, Ken Karen - and other days I'd be engineering hit singles for the producing and writing team of Ashford and Simpson and still other days singing background vocals. I even dabbled in management, handling my friend Tony Orlando because he needed a start." Arthur's contemporary work suggests this is also an amazing time in his life; recent projects confirm that Arthur remains an incredibly versatile talent, lending his expertise to a wide-ranging array of artists. Counted among his most current projects is Liza Minnelli's GRAMMY-nominated album Gently (Angel Records), which Arthur produced. In addition, Arthur has produced the multi-platinum first and second comedy albums by "Saturday Night Live" funny man Adam Sandler (the second album includes the overwhelmingly received "The Chanukah Song"), as well as Sandler's third album, What's Your Name?, which has been certified gold and is on its way to platinum. Arthur has also produced Adam Sandler's recently released fourth album, Stan and Judy's Kid, which contains "The Chanukah Song Part II" and the groundbreaking internet animated cartoon, The Peeper, which is also featured on this same album. He's produced Sax at the Movies (Discovery), a clever collection that features new versions of the time- honored movie-music classics like "As Time Goes By" performed by West Coast sax masters such as Eric Marienthal and Warren Hill. 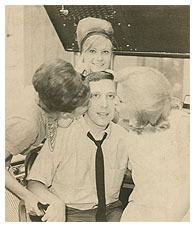 Much of Arthur's abilities were honed early on at the side of production and writing geniuses Jerry Leiber & Mike Stoller, Jeff Barry & Ellie Greenwich, and Bert Berns, and their sessions with The Dixie Cups, Shangri-Las, Angels, Chiffons, and others have proved some of the most lasting recordings in rock history. In addition, Arthur engineered over a dozen hits - from the early "Cherry Cherry" to the classics "Brooklyn Roads" and "Sweet Caroline" - for Neil Diamond. But those monumental sides were far from the only historically prominent rock records Arthur had a hand in creating. Van Morrison (Brown Eyed Girl, Astral Weeks, and Wavelength) and Bruce Springsteen (Greetings From Asbury Park and E Street Shuffle) are just two future Rock & Roll Hall of Famers whose records received the Arthur touch. Along the way, Arthur also worked closely with other producing legends, including Phil Spector, Russ Titelman, and Jerry Ragavoy.